When I picture hikers my mind conjures up images of willowy Scandinavians. Their perfect blonde hair, subtle but glowing tan, and immaculate khaki shorts cut high enough to show off their toned and muscular thighs. This image I have for the perfect hiker isn’t based on any life experience. The handful of dedicated hikers I have met and known have all been men, slender but moving towards gaunt, and to say they are “grizzled” might be an under sell. They often have gone through some stuff in life that they have no intereste in talking about, however their life experience still sits heavy in the sparse words they do use to talk about their lives. I don’t identify with the reality of the hikers that I have known or the perfetly perfect image I have created in my mind. A woman in her early 30s, bubbly, chatty, chubby, and I have never been able to pull off khaki. That is part of why I aggrandize “The Noble Hiker.” A man in the woods, one with nature, a rules junky for how one is to connect with nature and life. I have recently taken to the trails for some short hikes, but to my untrained body feel like epic journeys. I have found myself here, because after years of dreaming of being a hiker and adventurer I have been left with nothing to stop me from pursuing the trail. My year was one that tore me apart and left me with little of what I had perceived to be my life. Most of it was built on a false illusion of trust and loyalty. When my marriage dissolved in April I did my best to regroup quickly and move onto a path of growth. I wasn’t going to be this naive again, I wouldn’t feel that my worth was dependent on someone saying that I belonged to them, and I would show myself compassion for being a flawed individual. By early August. I was in a good space about everything. I was at peace with what had happened, that my life wasn’t going to be what I had imagined. I was open to the new possibilities. Truly, for the first time in my life I was showing myself self compassion. I’m not perfect or where I thought I would be, but as long as I keep growing I am moving in the right direction. It didn’t matter anymore what I thought, my life was now on hold. I had to heal. While I healed physically fairly quickly, the internal struggle was taking longer. I no longer felt safe. I felt isolated and alone, unrelatable, and directionless. As my lame joke goes, “I’m one eyed, unemployed, homeless, and divorced. Six months ago I was none of these things.” I decided to take to the road, to get out of town. Try to be that hiker, attuned to nature, woke woman I had always envisioned for myself. The realty is I have nothing more to lose, so why not keep growing. I keep trying to put all of this last year behind me. Quickly. No one wants to hear about it anymore. Its time to get it together and be the person I’m suppose to be. Move on Carol, you’re fine. On my recent training hikes I have found myself having this arguement with myself as I trudged along. Just be better, now, Carol. The only way to snap out of these talks with myself would be to stop and force myself to take in the nature I had been so desperate to surround myself with. 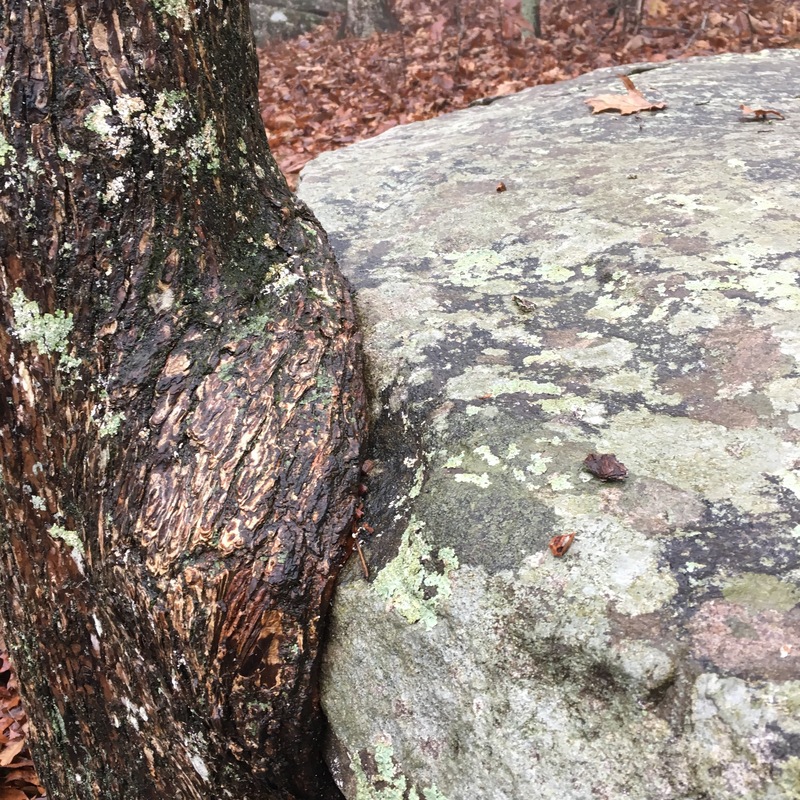 On my hikes I kept noticing trees that had run into and grown around boulders. The tree was on a clear path of growth when it ran into the boulder. Instead of its growth coming to a quick and untimely demise the tree grew around the boulder. Not went around or avoided the boulder, but actively grew around the boulder to the point where it is incorporated into its make up. The tree would not stand the same if it hadn’t incorporated the boulder into it growth. I have seen trees that just lightly brush against the boulders and those that have seemed to spread out and comsumed the boulder. Lingering around its hard surface. These sights have become calming reminders to me when my spirit grows tired. Some trees have all the right ingredients for growth, they sit in a spot with a wealth of direct sunlight and plenty of space to grow straight and narrow towards the sky. These aren’t the trees that stop me in my tracks to take them in. It’s the ones that twist and turn as they fought for their space, for their light. Its the trees that collided with insurmountable barrier and grew around it. The barrier that they out grew became a part of their story. These are the stories of the forest that keep me on the trail.